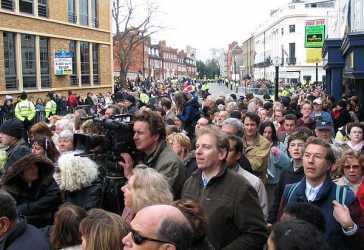 Photographs of the Royal wedding of Prince Charles to Camilla, taken from near Windsor's Guildhall, as the Royal procession passed down Windsor High Street on its way to Cambridge Gate and into Windsor Castle for the Blessing in St George's Chapel. 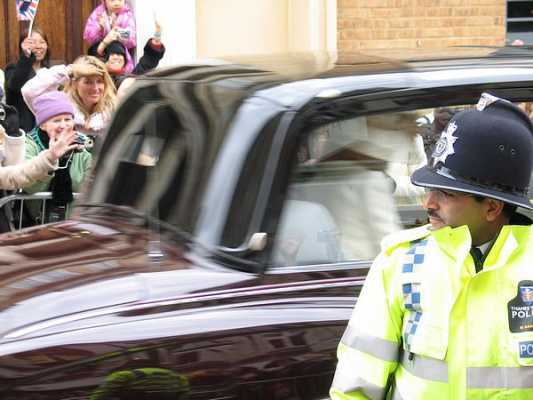 Large crowds had gathered to line the streets and take photos of the couple as they drove to Windsor's Guildhall for the morning wedding service. 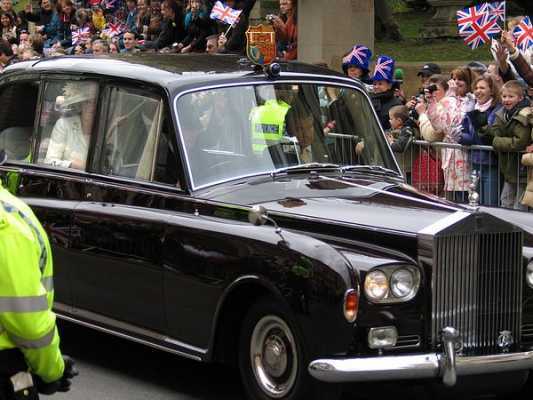 Prince Charles and Camilla left Windsor Guildhall in a black Rolls Royce as the crowds waved and took photos. 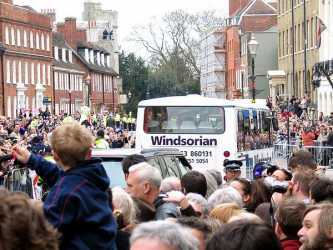 Close members of the Royal family followed behind in a bright white 'Windsorian' coach... making for fun photos and an amused crowd. 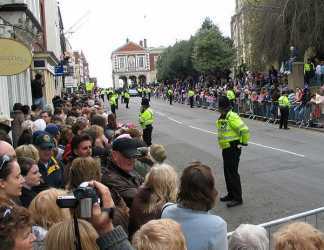 After the Royal couple had passed by, the crowds dispersed. 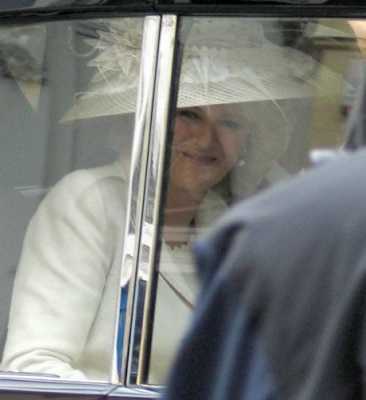 Prince Charles and Camilla, now the Duchess of Cornwall, were later to attended a Service of Blessing in St George's Chapel within the grounds of Windsor Castle, conducted by the Archbishop of Canterbury. 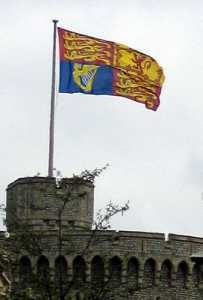 The Royal Standard was flying from the top of the Round Tower of Windsor Castle as tradition dictates, to let castle staff and the town know that the Queen was in residence. 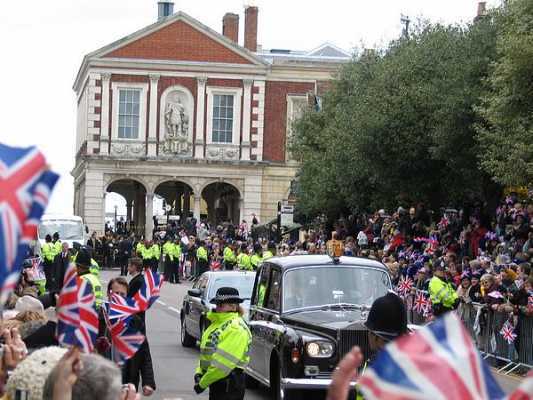 On this wedding day, the Royal Standard was much larger than normal, and the wind kindly blew the flag in a direction so that all could see it - if only the people were as easy to photograph! - and unlike the snow and rain that fell yesterday, the original wedding date, the weather was bright and sunny for the wedding day. If, like this amature photographer, you would like to improve your skills with the camera, then click this link to find out more about the London Master Class photography workshops given by one of the UK's leading fashion photographers. 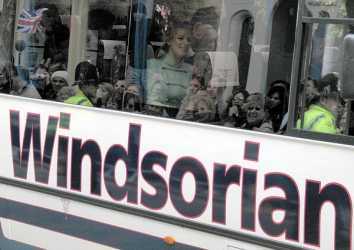 If you would like to visit Windsor and explore this wonderful Royal town, the River Thames, nearby famous Eton boys school and of course Windsor Castle, then scroll down from some helpful accommodations suggestions. Very limited self-catering rental accommodation in Windsor is available, so unless you book early the alternatives are B&B and hotels. 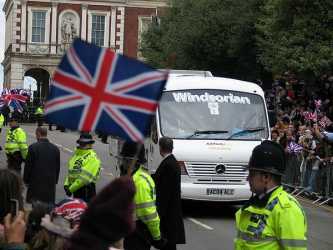 Click here for more photos of Windsor, Windsor Castle and Eton.